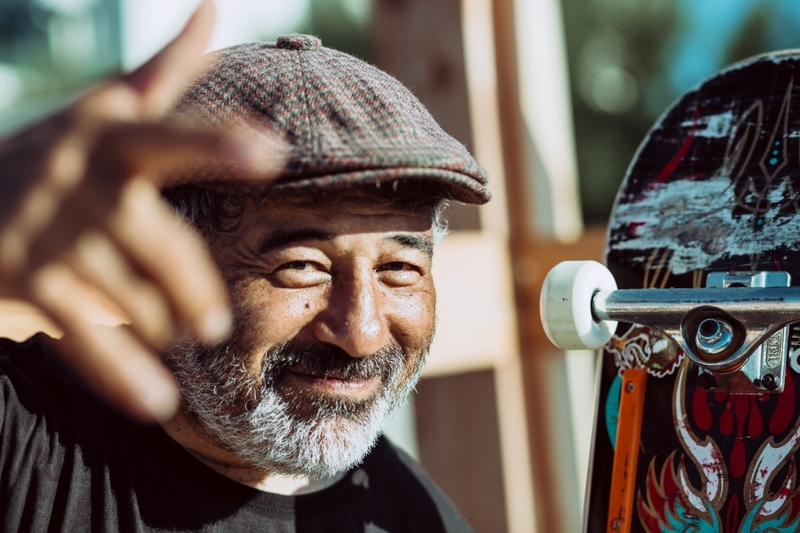 Those readers of a certain age (and those with a penchant for a certain Tony Hawk’s Pro Skater 2 game) will likely hold a place in their heart for Steve Caballero, the man Thrasher Magazine once labelled “The Skater of the Century” in the late 1990s and the forefather of modern vert ramp riding. Caballero turned professional in 1980, when the infamous Powell Peralta skate company offered him the chance to show off his aerial skills to a wider audience than those who could afford to use the expensive Californian skate parks of the time. 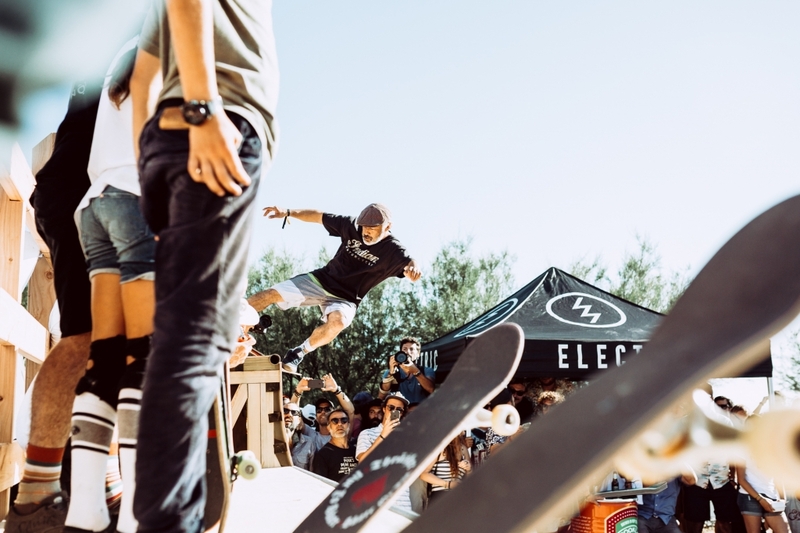 He has been credited with inventing the fakie 360 aerial, also known as the’Caballerial’, as well as holding a long-standing record for the highest air on a vert ramp (11ft, if you want to know), which was only beaten by Danny Way in 1997. Now in his fifties, Cab still tours the world and wows crowds with technical vert demonstrations but his love of art, music and motorcycles has started to take priority in his busy schedule. We caught up with the man at this year’s Wheels & Waves festival to get to the bottom of his motorcycling history, his newfound love for Flat-Track racing and his desire to get on a surfboard for the first time. Flat-Out: Is this your first Wheels & Waves event? If so, what do you think of it? 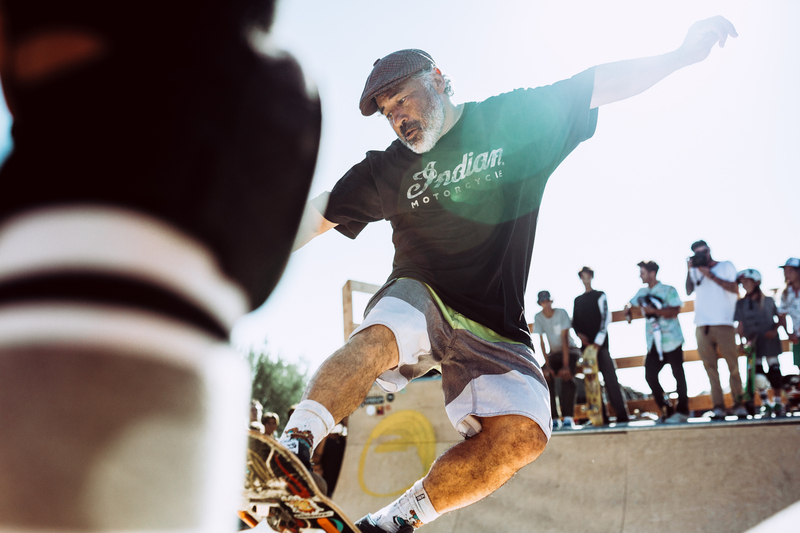 Steve Caballero: Yeah, first time here and it’s amazing. This festival is everything I’m into, it’s all the lifestyles and activities that I do back home, so it is the perfect event for me. I’ve seen it on the internet and friends have shown me some videos of previous years, so I knew I had to come. Luckily, Vincent, one of the organisers, invited me and made it happen. FO: You have a hook-up with Indian Motorcycles. What’s going on there? SC: It’s exciting man. I’ve got a little ambassador sponsorship thing going on and I will be building a bespoke bike with Roland Sands and we are going to debut it at the Brooklyn Invitational custom bike show in September. It’s all a bit top secret at the moment, because it’s based on the newest bike in the Indian group, but it will be cool, trust me. SC: It’s kind of a Bobber style thing and Indian has given us a little bit of budget to put our stamp on it. I’m going to try and add my flavour. Roland lives right near me and he knows those bikes really well, but I told him that I wanted to physically be part of the creation process. If there’ anything I can do on the bike, I will do it myself. But you’ll have to wait to see more. FO: Have you always had a passion for motorcycles? SC: Yeah, a motorcycle was one of my first real forms of transportation. I think I bought my first bike in 1982, right before I graduated from high school and I remember it vividly. It was a little Honda MB5, a cross between a moped and a bigger bike. From there, I stepped up to a Kawasaki Ninja 250 and then I jumped straight on a Honda CBR 600, so there was quite an increase in speed over a short space of time. Around ten year’s later I started to really fall in love with old British motorcycles and I got my first ’63 BSA. That lead me to buy a couple of Norton Commandos and then I ended up with a 1959 Ariel Square Four, which I still own. FO: Is that still an aesthetic you love to this day? SC: Of course, those bikes are beautiful but my tastes have changed a lot over the years. I remember after my British bike phase, I started to really get into Hot Rods and then I moved from street bikes to dirt and got heavily into motocross. I think there are lots of similarities between skating and motorcycles because whenever I hear a board skating down the road, I want to look. It’s the same for bikes. It’s like an obsession. 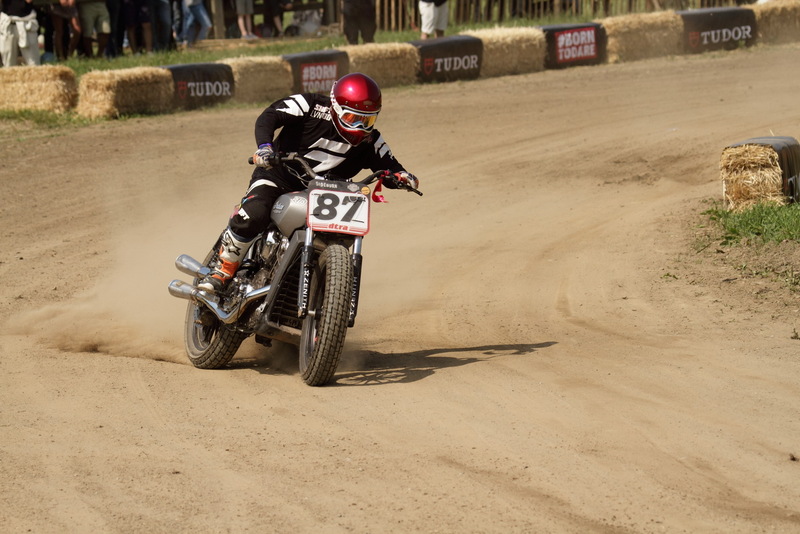 FO: You raced at the El Rollo Flat-Track event on the first day of this year’s Wheels & Waves, how was that? SC: That was my first attempt at Flat-Tracking and I loved it but I think the motocross skills helped me stay upright. I tried to apply what I know about motocross but it’s hard when you’re riding a 1941 Harley-Davidson Flathead and a Yamaha SR400. The Yamaha was excellent, though. FO: Wheels & Waves is also about the surf; a California man like yourself must be pretty handy in the ocean, right? SC: Ha ha, I’m a little embarrassed to say that I’m not very handy in the water. I can skimboard and did a lot during the 1980s, but that’s probably about as close to the waves that I have ever been. FO: Was it a choice you faced as a kid? 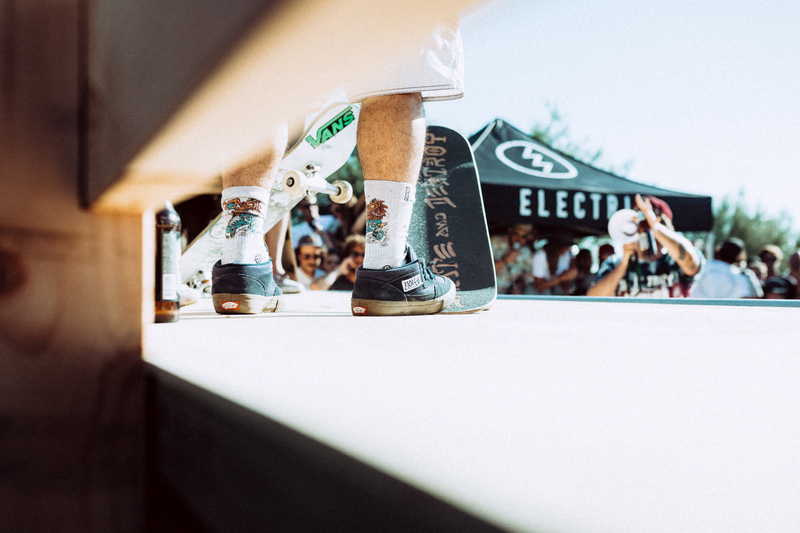 To surf or skate? SC: It wasn’t really a choice because Santa Cruz was about 40 minutes away from me and I didn’t live by the beach. Skateboarding was just a lot more accessible and the beach was a lot of work back then, there was a lot aggression. The surf industry wasn’t very welcoming and surf spots could be very localised. I didn’t need the hassle. I’ve always admired surfing and that way it looks, it’s very stylish and I guess skating came from surfing and that desire to practice surf moves when the waves weren’t firing, so we owe a lot to it. SC: Ha! I now live about ten minutes from the ocean and I have been thinking that it is a good time to get in the water and learn how to surf. I’m friendly with Joel Tudor and Rob Machado, so they could be good mentors for me. FO: There’s currently a trend in the surfing industry to go back to the retro aesthetics and style, does the same apply to skating? SC: I think skating is in a great place right now because some guys are going back to the more retro boards, so there’s a respect for the history, but the sport has moved on to something much more accessible now. All skate parks were privately owned when I was skating in the 1980s, so you had to pay. But now, there are thousands of really good free parks springing up all over the world and it’s just so easy for kids all over the world can get involved. I’m just so lucky that I can still travel the world and skate new parks and people still know who I am.